Crime deserves punishment, similarly Honesty deserves a reward. Chipko Movement was lead by Sunderlal Bahuguna, similarly Narmada Bachao Andolan was lead by Medha Patkar. It follows (+5 , +5) pattern. It follows (+3/+5, +4/+6, +5/+7, +6/+8……) pattern. It follows (+1.5 , +2.5 , +3.5 ,+4.5 , +5.5…) pattern. 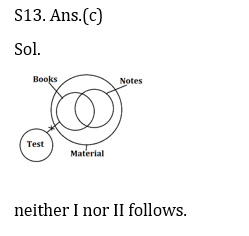 Q13. In the following question, two statements are given each followed by two conclusions I and II. You have to consider the statements to be true even if they seem to be at variance from commonly known facts. You have to decide which of the given conclusions, if any, follows from the given statements. Q14. If 6 Feb 1902 was Thursday, then 27 March 1903 will be what day of the week? यदि 6 फरवरी 1902 बृहस्पतिवार था, तो 27 मार्च 1903 को सप्ताह का कौन सा दिन होगा? Q15. A word is represented by only one set of numbers as given in any one of the alternatives. The sets of numbers given in the alternatives are represented by two classes of alphabets as shown in the given two matrices. The columns and rows of Matrix-I are numbered from 0 to 4 and that of Matrix-II are numbered from 5 to 9. A letter from these matrices can be represented first by its row and next by its column, for example, ‘M’ can be represented by 56, 69 etc. and ‘I’ can be represented by 33, 87 etc. Similarly, you have to identify the set for the word ‘FAME’.